I am thankful to live in a free nation protected against its government by the Constitution. 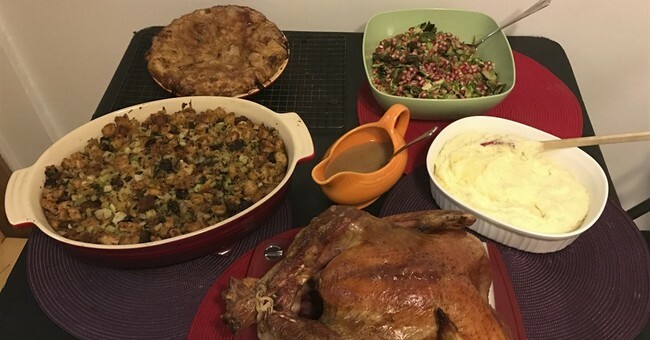 I am thankful for American food, the abundance, the diversity, and the deliciousness. I am thankful to live amongst the American people, the most caring and charitable people in the world. I am thankful for free enterprise, thankful that I was free to choose a career and pursue that career without ever having a single family member in that field to help me along. I am thankful that I was free to choose who to love and marry. I am thankful to be free to choose to practice any religion or none at all. I am thankful for the diversity of American state laws and the freedom to choose to live in a state with laws that conform to my values. I am thankful for my parents who have taught me to be the best that I can be and to respect my country and its laws. I am thankful that my president is as proud to be an American as I am. I am thankful to live amongst the free and the brave, amongst men and women who volunteer to protect our great nation. I am thankful that I do not live in a socialist county, where the government is in complete control of its people. I am thankful that I do not have to wait in line for food like I did when I was a little girl in the USSR. I am thankful that my food choices are not limited by my government (albeit, I do not live in California). I am thankful that my parents were wise enough to know that we are not Russian-Americans. I am grateful to my parents for always reminding me that we came to America to be Americans. I am thankful for the opportunity to pursue the American Dream. I am a thankful American.